The RP Photonics Buyer's Guide contains 30 suppliers for mid-infrared laser sources. Ask RP Photonics for design services concerning mid-infrared sources like OPOs. You can also get the powerful software RP ProPulse, with which one can e.g. simulate sync-pumped OPOs. This article discusses those sources of mid-infrared light which emit laser-like beams. They may either contain a mid-infrared (mid-IR) laser or some shorter-wavelength laser combined with means for nonlinear frequency conversion. The mid-infrared spectral range is often understood to include wavelengths from 3 μm to 8 μm. Note, however, that substantially different definitions are used by different authors. Typical applications of mid-infrared sources are the laser absorption spectroscopy of trace gases and military countermeasures for airplanes against heat-seeking missiles. Quantum cascade lasers represent a relatively recent development in the area of semiconductor lasers. Whereas earlier mid-infrared semiconductor lasers were based on interband transitions, quantum cascade lasers utilize intersubband transitions. The photon energy (and thus the wavelength) of transitions can be varied in a wide range by engineering the details of the semiconductor layer structure. Even for a fixed design, some significant range for wavelength tuning (sometimes more than 10% of the center wavelength) can be covered with external-cavity devices. Many quantum cascade lasers can be operated at room temperature, even continuously, although the best performance values are achieved for cryogenic cooling. The generation of short pulses with durations far below 1 ns is possible, although with fairly limited peak powers. Before quantum cascade lasers were developed, large parts of the mid-infrared spectrum were accessed with various types of lead salt lasers. These are typically based on ternary lead compounds such as PbxSn1−xTe or with quaternary compounds like PbxEu1−xSeyTe1−y. The bandgap energy, which determines the emission wavelength, is fairly small – below 0.5 eV. Lead salt lasers need to be operated at cryogenic temperatures (normally well below 200 K, particularly for the longer wavelengths). They produce only low power levels (typically of the order of 1 mW), and their wall-plug efficiency is very low compared with that of shorter-wavelength laser diodes. Wavelength tuning over a few nanometers is normally possible via the device temperature. Cr2+:ZnSe (chromium-doped zinc selenide) lasers (and some lasers with similar materials) can emit up to roughly 3.5 μm. They are broadly tunable and can easily produce hundreds of milliwatts of output power. Fe2+:ZnSe lasers can emit at 3.7–5.1 μm. Fiber lasers based on erbium-doped or holmium-doped fluoride fibers can emit at wavelengths around 3 μm. The choice of laser crystals and glasses is limited to those with fairly low phonon energies, because otherwise the laser transition would be quenched by multi-phonon transitions. Only few gas lasers emit in the mid-infrared region. An example is the helium–neon laser emitting at 3.391 μm. Deuterium fluoride chemical lasers can emit around 3.8 μm wavelength. They are used for some military purposes. For continuously operating lasers, the nonlinear conversion efficiency is typically quite low, and the generated output power is often even below 1 mW, which however is often sufficient for spectroscopic investigations. Much higher outputs are possible with pulsed beams, e.g., from Q-switched lasers, which of course need to be synchronized precisely. Recently, it has become possible to fabricate orientation-patterned gallium arsenide (GaAs), which allows one to obtain quasi-phase matching for difference frequency generation with a very wide range of output wavelengths. A mode-locked picosecond Nd:YVO4 laser at 1064 nm can be used for synchronous pumping of an OPO with a LiNbO3 crystal, allowing idler outputs up to 4 μm or even 4.5 μm, with the limit set by the increasing idler absorption at long wavelengths. Such an OPO will usually have a resonant signal wavelength, whereas the idler wave is directly coupled out after the nonlinear crystal. Q-switched lasers are often used for pumping nanosecond OPOs reaching far into the mid-infrared region. Common crystal materials for such applications are zinc germanium diphosphide (ZGP, ZnGeP2), silver gallium sulfide and selenide (AgGaS2, AgGaSe2), gallium selenide (GaSe), and cadmium selenide (CdSe). As many of these materials are not transparent in the 1-μm region, one often has to use tandem OPOs: a first OPO converts the 1-μm laser radiation to a longer wavelength which is then used to pump the actual mid-infrared OPO. Both signal and idler of the latter can be in the mid-infrared spectral region. Such devices can easily generate pulses with energies of tens of millijoules. The output wavelength may be tuned over hundreds of nanometers. Mid-infrared laser sources require special optical elements working at the relevant long wavelengths; see the article on infrared optics. Menlo Systems mid-infrared lasers based on Menlo figure 9® patented laser technology are targeting the wavelength range from 1 μm to beyond 10 μm. Systems are available from single femtosecond lasers to full mid-infrared Optical Frequency Comb systems. Applications range from sensing to high precision laser spectroscopy. The spectral region between optics and electronics lying in the mid-infrared is difficult to access. Nevertheless it is of great spectroscopic interest because it hosts the majority of molecular finger prints: important vibrational modes with energies in the spectral range of 670 cm-1 to 3400 cm-1 can be accessed by exciting the sample at wavelengths of 3 μm to 15 μm. 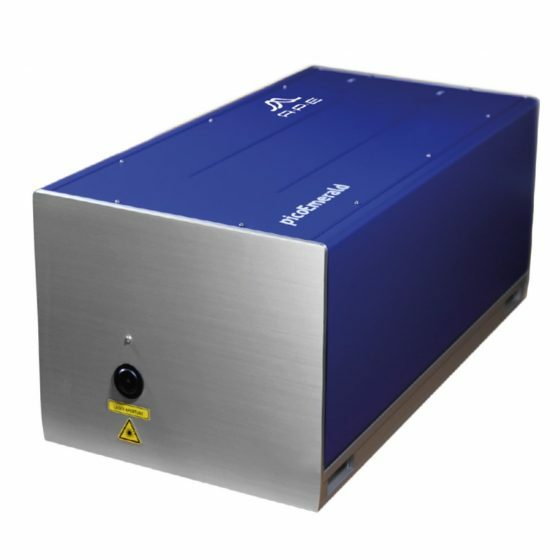 TOPTICA’s ultrafast fiber laser FemtoFiber dichro midIR generates powerful radiation tunable between 3 μm – 15 μm that is ideally suited for spectroscopy and (nearfield) microscopy applications. Based on difference frequency generation (DFG) of two optically synchronized laser pulses at tunable wavelengths of 1 – 2 μm a highly stable broadband emission of approximately 400 cm-1 is generated. Here, the powerful fundamental output at 1560 nm of an erbium-doped ultrafast fiber laser is superimposed with the long or short wavelength part of a supercontinuum. For the mid-IR region, APE offers the Carmina, a professional IR light-source for the integration with scattering SNOM and AFM-IR microscopes. Carmina sets new standards in resolution, sensitivity and tuning range due to its OPO/DFG architecture. The unique combination of 300 cm-1 broadband as well as 20 cm-1 narrowband emission covers the two complementary nanoscale IR techniques s-SNOM and AFM-IR. The outstanding high output power between 5 mW and 300 mW in combination with an extremely low noise level is addressing a wider range of applications in the near-field imaging & spectroscopy field.